exposure to certain stimuli (such as a streptococcal infection in the throat, alcohol, medicines and local irritation) or damage to the skin, may cause an outbreak of psoriasis in persons who have this genetic predisposition. Types: psoriasis vulgaris (plaque psoriasis) and psoriasis pustulosa (pustular psoriasis). 6 per cent of the people who have psoriasis also get psoriatic arthritis in the joints. Psoriatic arthritis primarily occurs in fingers and toes, but is also quite common in the back bone. the patches grow bigger and become scaly. the upper scales fall off in large quantities, while the lower layers of scales are firmly fixed. when the scales are scraped off, a number of small, bleeding points can be seen underneath. psoriasis of the nail often manifests itself as small indentures in the nails. The outbreak can be so severe that the nail thickens and crumbles away. flexural psoriasis occurs in skin folds (flexures). 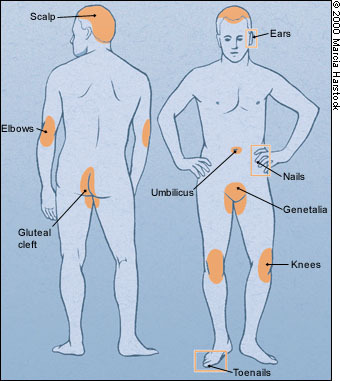 Red, itchy plaques appear in the armpits, under the breasts, on the stomach, in the groin or on the buttocks. The plaques are often infected by the yeast-like fungus candida albicans. The treatment, which should be carried out in close collaboration between the patient and the GP or the dermatologist, consists of various local and systemic treatments. 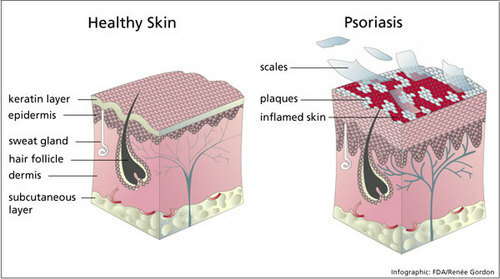 It depends on the patient's age, state of health and on the nature of the psoriasis. calcitriol (Silkis) or tacalcitol (Curatoderm)). Combining a corticosteroid with another topical treatment, either as separate products used at different times of day, or as a combination product, eg Dovobet (calcipotriol and betamethasone) or Alphosyl HC (coal tar and hydrocortisone), may be beneficial for chronic psoriasis vulgaris. Special lotions are available for scalp treatment. These often contain salicylic acid, coal tar, sulphur or corticosteroids. Phototherapy (ultraviolet B, UVB) and photochemotherapy (psoralent ultraviolet A, PUVA) are both used for widespread psoriasis. Many patients find that natural sunlight also helps. Oral treatment with immunosuppressants such as ciclosporin (Neoral), or methotrexate (eg Maxtrex) or the vitamin A derivative acitretin (Neotigason) may be used for patients with severe, widespread or unresponsive psoriasis. Intensive research is being carried out to find better treatments for psoriasis and new treatments are regularly introduced which improve the condition in some patients. People who have family members with psoriasis, especially if they are exposed to stress, alcoholism, infections, medical treatment, or events such as divorce, bereavement or moving house.